Final Fantasy 15 is the latest installment in the cult franchise from Square Enix. 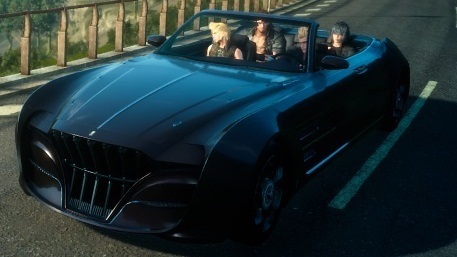 The new title brings great new features such as the addition of "Regalia", a convertible vehicle useful for the operation of Noctis and his friends. Check out how to customize and upgrade the car. Although the car is driven by Ignis most of the time on autopilot, the protagonist Noctis can also drive the vehicle through the Eos roads. Early in the game, the group of heroes must find a way to pack the wrecked car to continue their journey. From there they meet Cindy, the one responsible for taking care of "Regalia" throughout the adventure. Step 1. Open the map menu and locate the "Parking Locations" tab. The "Hammerhead" repair shop and gas station is the first secure location discovered, so it will be available on the map from the beginning. Step 2. Then press "Hammerhead" to make a quick trip to the desired location. It is important to note that fast trips cost a modest fee charged in "gil". If you want to expedite transportation, it is very worth investing the money. Step 3. Then start a dialogue with the character Cindy, who is always in front of the workshop, located next to the gas station. After completing Cindy's primary assignments - yes, you need to complete all the initial activities before enabling the customization features - she will offer two options: "Maintenance" and "Customization." Under "Maintenance", the car will be repaired if it has suffered serious damage or broken on the road for some reason that is a feature used only on punctual occasions. In "Personalization", it is possible to modify the color of the wheels and body of the "Regalia", besides the interior, like seats and accessories. You can also apply pre-made decals purchased at convenience stores or purchase new stickers with Cindy herself. The value of the modified parts and cosmetic applications is shown next to the "Select" tab. At first, modest colors and pieces are offered for free. In addition to the visual changes, Cindy also modifies the components of "Regalia" to make it more powerful. New installations can be made through the "Install" tab, however the pieces must be found in the game world. To do this, simply follow all Cindy oriented goals.